The 14KW Manifold Control Pack distribution unit is designed to provide reliable flow temperature control, flexible installation and easy start-up. Available with a pre-mounted booster pump. Note: If ball valves are required to connect to the bottom of this blending kit please order 3/4" ball valves. 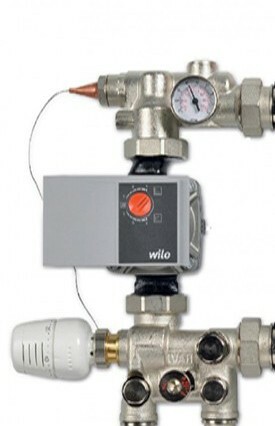 Should the ball valves be required to connect between this blending kit and the manifold please order 1" ball valves.